GEORGETOWN, Conn., Feb. 5 1949 -- Harold R. Foster, creator of the exquisitely drawn adventure strip, "Prince Valiant in the Days of King Arthur," which appears in the Sunday Post-Dispatch, was fired from the first regular job he ever held for taking off on a busy day to go duck hunting. Reporting for work after his day's hunting trip, he was summoned by his boss, handed the pink slip and listened to a somewhat lengthy lecture. "You seem," concluded the boss, "to think that duck hunting is more important than business." "Isn't it?" asked Foster, in genuine amazement that any living being could hold a different opinion. All that was many years ago, but Hal Foster, now in his fifties, still thinks that work is something you do in between times when the ducks aren't calling or the fish aren't biting. "My working schedule is really harsh," says Foster, who recently acquired an old Connecticut farmhouse and several hilly acres some half-hour's drive from this little village of Georgetown. "If I look out of my studio window and see a limb fall off a tree, I've got to investigate. Usually it's hours before I can make myself return to my drawing board. But at nights and on bad days I catch up on the hours I spend out of doors." Actually hours of labor go into the production of each of Foster's Sunday pages. And because in "Prince Valiant" he carefully recreates the authentic flavor of the days of King Arthur, Foster spends endless hours in research. "I made a few historical boners at first," he grins. "Such things as having dinosaurs showing up in medieval times. But every time my hand was called, it made me more careful. "Some of the fan mail I get on 'Prince Valiant' is amazing. Students write in with all sorts of fascinating information they've unearthed in their studies of that period of history. "Many of Prince Valiant's greatest fans are not children, but professors I picture as spending their lives in great libraries studying the literature on medieval times." Foster, himself, has had almost as adventurous a life as Prince Valiant. Gold prospector, north woods guide, Canadian fur-trapper, and boxer, his life has been filled to the brim with drama, color, adventure and excitement. Born in Halifax, Nova Scotia, of English - Prussian - Irish ancestry, he comes of a family of seafaring men and ship owners. "We were of the shabby gentility," he smiles. "Old highbinders on both my parents' sides of the family founded a considerable fortune and their descendants spent it. "By the time the family got down to me there wasn't anything left but a lot of odds and ends in the attic which the old boys had accumulated in their travels, things like an old swordfish saw, a Jamaican hat, some dueling pistols and stacks of old log books." At the age of 10, Foster was bailing a 30-foot boat alone in the dangerous waters off Halifax; at 14, while prospecting for gold, he was earning a living as a trapper in the Nova Scotian wilds. When Foster moved to Winnipeg with his family, he found that his English accent and mild face and manner were interpreted by the other boys as indications of a slight sissiness. After taking several beatings at the hands of the school bullies, he decided to take up boxing. He fought a few professional bouts and then lost interest. Fishing, he decided, was much more fun than fighting. In school, Foster liked only one subject — art. He remembers that the highest praise he ever drew from a teacher was a remark one of them made to his mother, "He's not exactly stupid, but ..."
So Foster quit school and got his first job as an officeboy in a mercantile business and promptly got fired for going duck hunting. "Then I got my first job as an artist," he recalls. "It was as an illustrator for a Hudson's Bay company catalog. I remember my first chore was to illustrate a page on women's drawers. That was around 1910 when they were wearing drop-seat suits with lace around the legs. "From ladies' drawers, I graduated to princess slips and corset covers. The day I got to men's herring bone tweeds, which were considered the tops because of the fine lines you had to draw, I knew I'd gone as far as I could go. So I quit." In the meantime, Foster had met and married his wife, Helen, an American girl from Topeka, Kan. He had also saved up enough money to consider some serious study in the field of art. So bundling his wife off to her grandmother in Topeka, Fosters set off on a 1000-mile bicycle trip to Chicago to study at the Chicago Art Institute. He joined a firm of young advertising artists and soon had his family, which by now numbered a wife and two sons, enconsced in a Chicago basement apartment. "I was doing all right, but then came the depression and every advertising artist was on an enforced diet," Foster grimaces. "Five people committed suicide within the sight of my studio window. There wasn't much for us artists in the firm to do, so We set up a ping-pong table and a dart game and had a little fun while we were slowly starving to death." Times were tough, but Foster, his wife and two children, managed. Swimming in the lake was free and that's where the Foster family spent most of its time. Then came 1931 and Foster was approached to draw an adventure strip, "Tarzan and the Apes." In spite of the fact that he had been earning very little money, he was fairly happy in the achievement of a certain artistic success. His pictures had been hung in various places and he had taken his share of prizes. He did not exactly relish the idea of becoming a comic artist. "But I sold my soul to the funny papers and it paid," he says. "I had a certain obligation to the guys with whom I was In business and for six months the money I earned from Tarzan was the only dough that came into the firm." Soon Foster had made a name for himself in the field of comic art. "The appearance of Harold Foster's work," wrote one critic, "started a new period and almost finished it; the man was so good at his particular job that there remained little for subsequent workers to improve on, and very few have had the ability to come anywhere near him. "For the first time, Foster brought to the strips a complete mastery of figure drawing. Foster possesses also the true illustrator's passion for periods and authentic detail. He is a remarkable figure among comic artists, and his place in strip history is unique." In 1936, Foster turned Tarzan over to another artist and went to work for King Features Syndicate, under contract to produce "Prince Valiant." The strip, with its exciting blend of legend and history, not only caught the immediate fancy of the young fry among comic page readers but was soon being praised by educators for its educational treatment of that fascinating period in history. 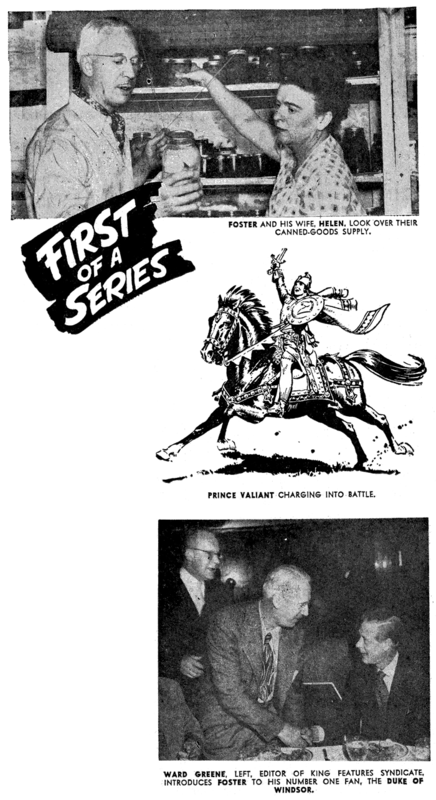 A great admirer of the strip is the Duke of Windsor and he is rated as Prince Valiant's number one fan. "God in His wisdom endowed me with certain imperfections but I have made Prince Valiant as I wish God had made me," says Foster. "Also I like to think of my wife as Mrs. Prince Valiant. You know when the Prince gets a little bumptious, Princess Aleta, his wife and the mother of his baby son, Prince Arn, quite often slaps his ears down. That's the way Mrs. Foster does me." In spite of his snow white hair, Foster has a young face and a lithe body that comes of hours tramping through the woods, building bridges, cutting down trees and generally working around his wooded acres. He is perhaps as contented a man as exists in the world. He says he hates "important people who are just important people and nothing else." He prefers to pick his own friends rather than be bothered by folks it is considered smart to know. He has one superstition born when he was a boy hunting and fishing in the Canadian woods. "Never," he says, "fail to face north and take a drink to the Red Gods before casting a rod or loading a gun." And he adds, "never shoot a sitting bird; never take more fish than will fit in a frying pan; never take more liquor than you can hold like a gentleman." "I often think of what my first boss said about business being more important than duck hunting," he smiles. "It isn't, you know. For instance I could make more money than I do by working harder, but then I'd have no time to enjoy spending the money." Foster is no gatherer of possessions. He's satisfied with his simple life in the Connecticut hills. His house is comfortable, his wife is happy, his two sons are well on the way to success of their own. "The piling up of possessions is regarded with much approval," says Foster. "Many people strive to do that all their lives. Monkeys and bluejays also collect bright objects." "So few people take time off to enjoy what they already have that trout streams and hedgerows are left for the peaceable enjoyment of such leisurely financial incompetents as I." Actually Foster is far from the financial incompetent he pictures himself. 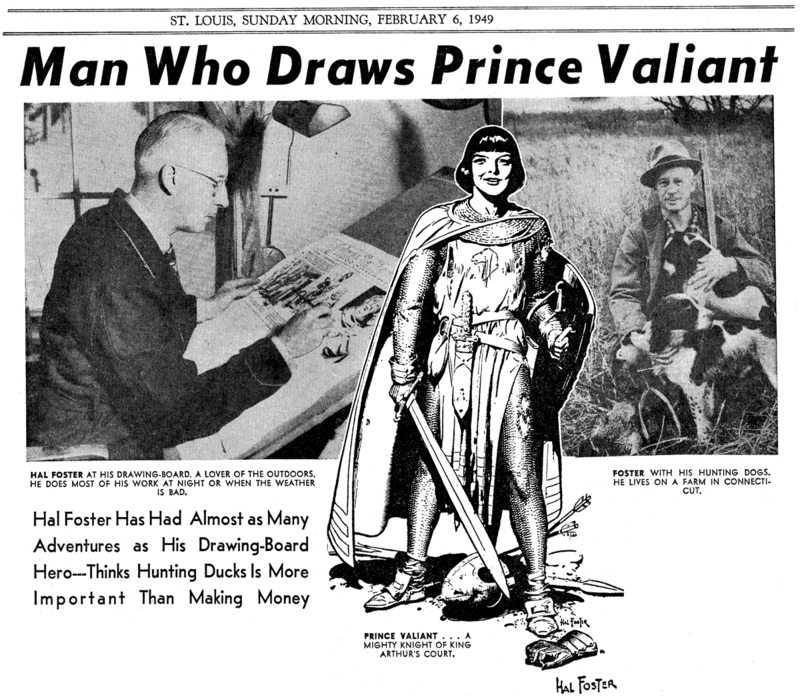 Prince Valiant appears in more than 100 Sunday papers throughout the United States and, before the war upset conditions abroad, was carried in dozens of foreign papers and translated in some 10 different languages, Including Spanish, Dutch, Danish, Italian, Swedish, Finnish, Norwegian and Portuguese. But more than of the success of Prince Valiant, Foster enjoys talking of the joys of his "estate." "It has," he says contentedly, "everything. There are deer in the woods and that trout stream outside my kitchen door talks to me in the night." Thanks to Cole Johnson, who supplied a scan of this clipping from the St. Louis Post-Dispatch. This is part 1 of a 5 part series that they ran in 1949. We will be presenting all 5 episodes in upcoming posts.